ST KILDA'S Jarryn Geary might have only just received his NAB AFL Rising Star nomination but he has already seen first-hand what it takes to win the award. Geary is a product of TAC Cup side Bendigo Pioneers and came through the system with Geelong star Joel Selwood, who won the award in 2007. Geary and Selwood played much of their junior careers together and also attended the same school, Catholic College in Bendigo. "He was always the talk of the town. I watched him work really hard and I remember in under 18s he was in the gym every day trying to build up to what he is now," Geary said. "I've learnt a fair bit off him. He'd always drag me out to have a kick with him in the park. He's been good. "I've been to both of his grand finals and watched him play. He is someone I've got a lot of respect for. I love seeing him do well and he's one of the players of the league at the moment." While Selwood was always headed for the AFL, Geary's future was not so certain. Despite winning Bendigo's best and fairest in 2006, he was passed over in the national draft and eventually taken by the Saints with pick 58 in the rookie draft. At the end of 2007 he was elevated to the senior list and played 10 games last year. He has played in all eight of St Kilda's wins this year, earning the Rising Star nomination for his 19-possession game against Essendon on Sunday. 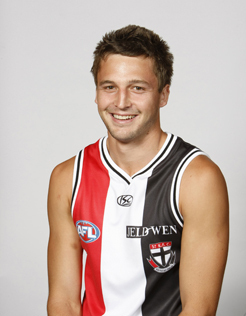 He said he and his fellow rookie-list graduates at St Kilda had to work hard to get noticed in the first place. "I came in the door with Rob Eddy and Clinton Jones. Jayden Attard was also a rookie that year and he played 22 games before he did his knee," Geary said. "It was good to come through with those boys. We were competing with each other to try and get on the list. It probably helped us out with where we are now. We all worked very hard and coming through with those guys really helped me along the way." Geary's work on the track caught the eye of the Saints' coaching staff and he consistently finished in the top five at time trials over summer. But he said he didn't expect to be in the team at the start of the year. "I thought during the pre-season that I wasn't going to play round one. A few things went my way with a few other defenders going down with injury. I was just hoping to get into the team in the first half of the year at some stage so I'm happy to be there." The 20-year-old is the youngest player in the number one side in the AFL but he says his chances of taking out the NAB Rising Star at season's end are slim to nil. "There's a fair few blokes ahead of me. Daniel Rich from the Brisbane Lions and Stephen Hill from Fremantle are looking pretty good at the moment so I think those boys will be right up there."